I love oysters – oh, so much! Mostly, I just eat them natural – not even any lemon juice – and it absolutely horrifies me that some people waste good oysters cooking them Kilpatrick – AUGH!!!! But sometimes, when I’m entertaining, I’ll make them this way – it’s a Neil Perry recipe that I’ve had for years. The oysters are only steamed for a mere two minutes so they’re only just cooked – it’s a good compromise for people who prefer their oysters raw and those that like them cooked. Make sure that once the two minutes are up you get them out of the steamer quick smart or they’ll become overcooked. The dressing is perfectly balanced and not at all overpowering – and the good thing is, you can make it earlier in the day and just gently warm it up when ready to serve. There’s actually enough dressing here for about three dozen oysters, so why limit yourself to one dozen?! In a small saucepan, mix together the sauce ingredients and warm slightly. Set aside. Bring some water to the boil in a wok. Place oysters in a bamboo steamer and steam over the boiling water for 2 minutes to just heat through. 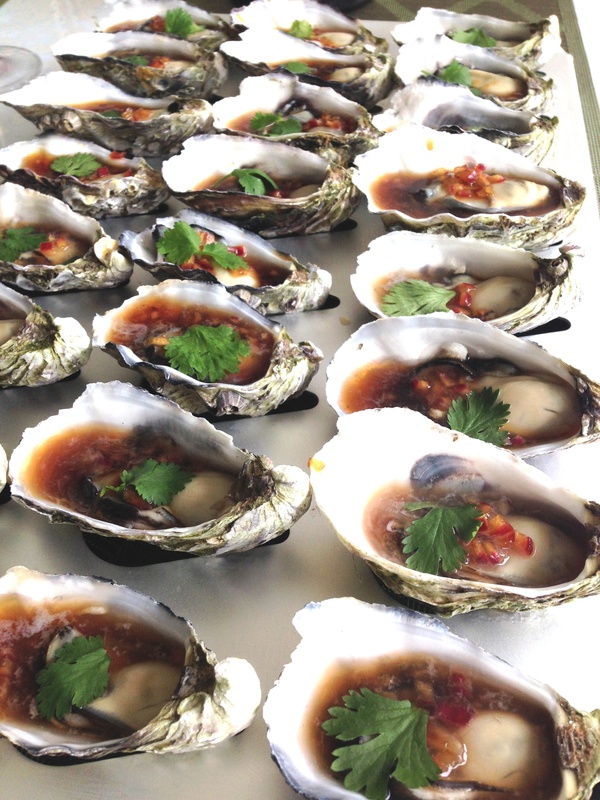 Arrange the oysters on a plate and spoon a little of the dressing over each one. Sprinkle with the sliced spring onions, or a small piece of coriander and serve immediately. Oh YUM!! I agree with the Kilpatrick, ick! The bbq sauce tastes so artificial.